Blog / Pest Management / Weeds / Is it a Weed? Depends on Who You Ask! Is it a Weed? Depends on Who You Ask! What is a weed? Merriam-Webster defines weed as “a plant that is not valued where it is growing and is usually of vigorous growth.” “Weed” is an epithet that humans apply, rather than a plant characteristic. 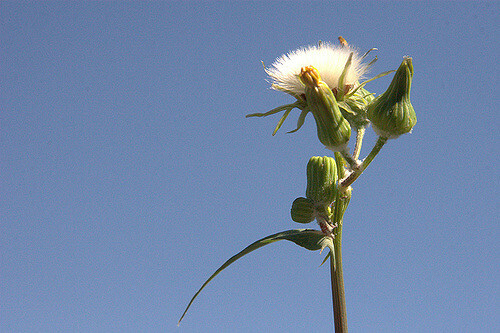 All plants have their niche in the natural world. Is it a weed? You decide. Driving through the Midwest, you’ll see a stalk of corn popping up in a field of soybeans. To the farmer growing soybeans, the corn is a weed. Down the road in another field, the corn is a valuable crop. Some plants considered weeds are edible—some people pull dandelions, while others plant them for edible greens. Today clover is considered a weed in lawns, but until the invention of broadleaf weed killer, clover seed was included in lawn seed mixes to improve nitrogen and provide nectar for bees. A weed isn’t always an introduced plant. Our native poison ivy (Toxicodendron radicans) may be native, but few of us want it in our yards! And fewer want to give up the food plants that arrived with immigrants from other parts of the world. A major characteristic of “weediness” is a plant’s ability to out-compete more desirable plants for sunlight, water, and nutrients. Plants that will rapidly take over our space are undesirable—kudzu anyone? Deciding what is a weed to remove depends, in part, on your use of a particular space. In spaces devoted to vegetables and other crops, you want all the inputs (fertilizer, water) going to support what you planted. But you might rethink your attitude toward “weeds” in the rest of your landscape. Is this an area you are using as outdoor living space—or merely a buffer zone between you and your neighbors? Do you need perfectly manicured lawns and gardens? Is that plant invasive or merely a little messy looking? Is the use of herbicides worth the cost, both financial and environmental? Is it a weed? Your answer depends—on factors such as garden location, purpose, maintenance requirement, personal tolerance, aesthetics, and environmental impact. Article written by Joyce Weinberg, Extension Master GardenerSM Volunteer. Visit the Extension Gardener Handbook, What Are Weeds? Editor’s note: Follow our blog this year as our writers highlight plants that may or may not be considered weeds. Each month, you’ll find a blog that describes different types of weeds and helps you identify and decide if it has a place in your garden.